Our winners are announced below (click thumbnails to see larger images). 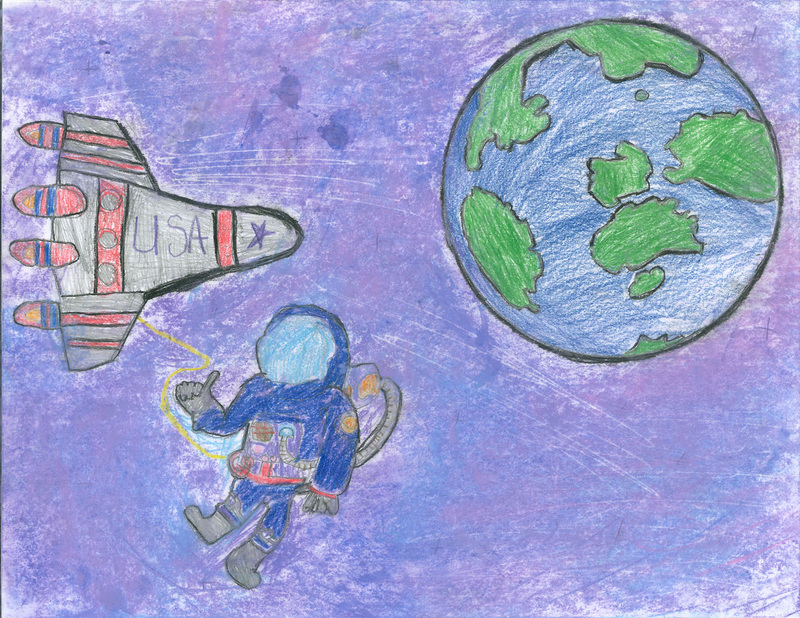 You can view the rest of the entries in our 2018 Art Contest Participant Gallery. Quote from the Artist: "All the beauty of the universe." 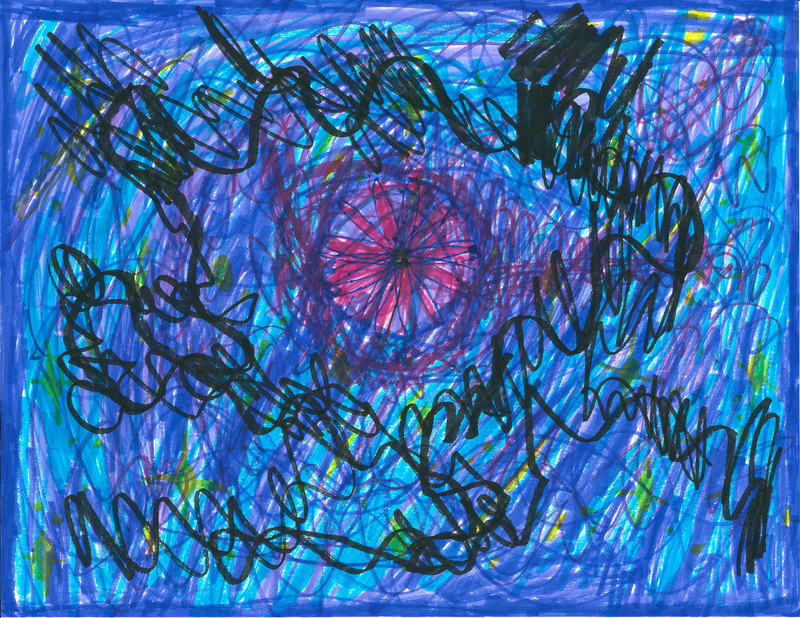 Quote from the Artist: "Space filled with stars from the mind of a 4 year old." Quote from the Artist: No quote given. 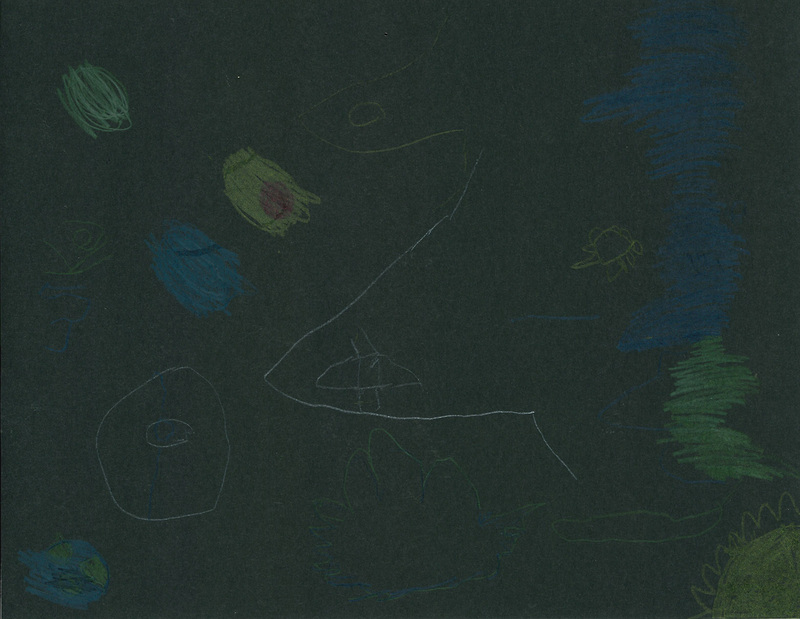 Quote from the Artist: Her daddy and mama showed her the stars and moon in the night sky. 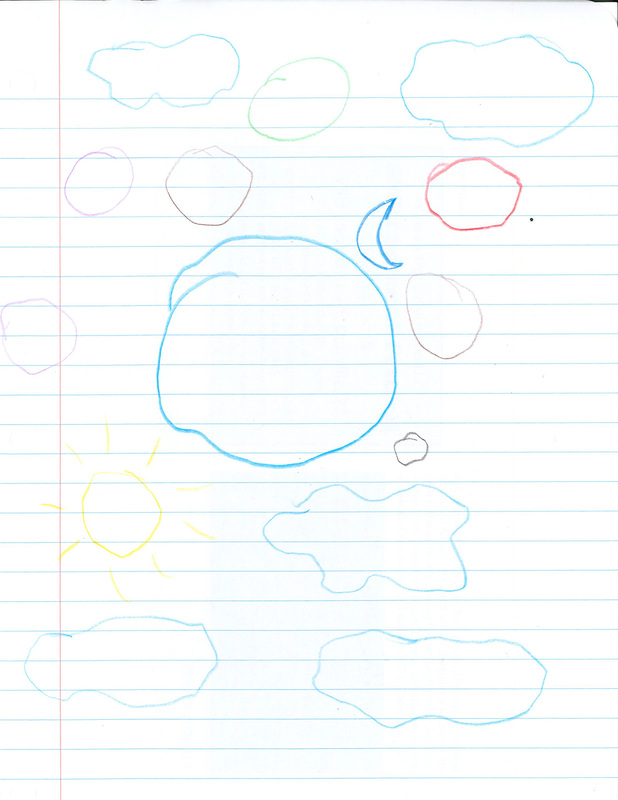 The next morning her mama asked her to draw where the stars and their friends lived. This is what she did with the help of her mama since she is so young. 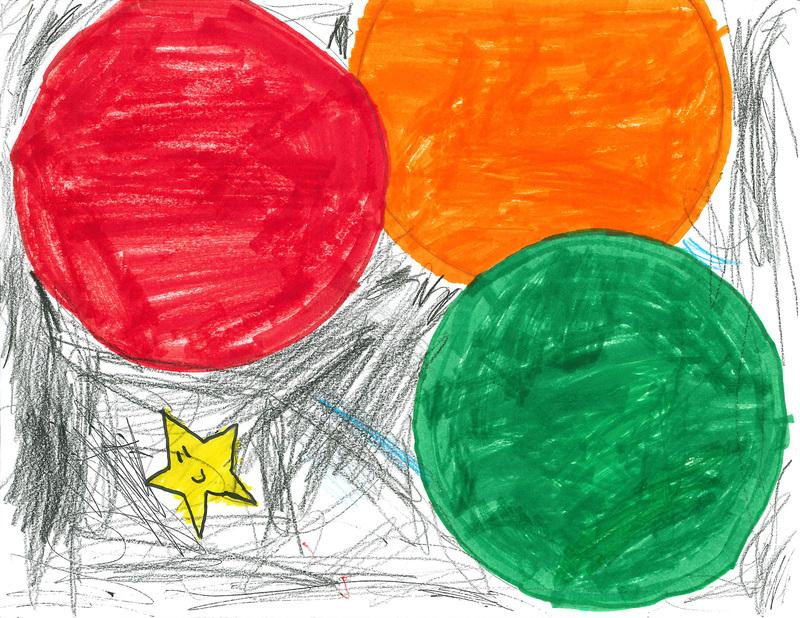 Quote from the Artist: "A colorful shooting star with glittering stars, the earth & sun and a little moon. 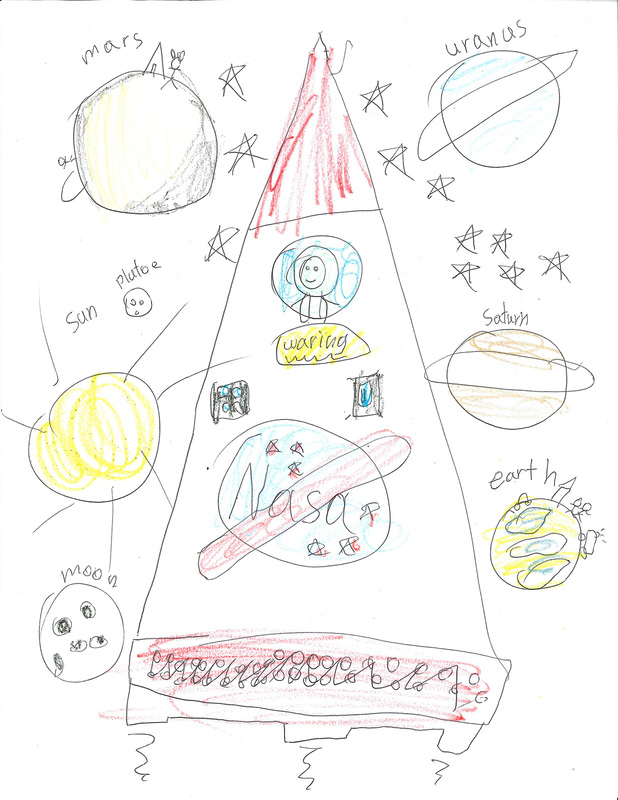 And an astronaut & space ship." 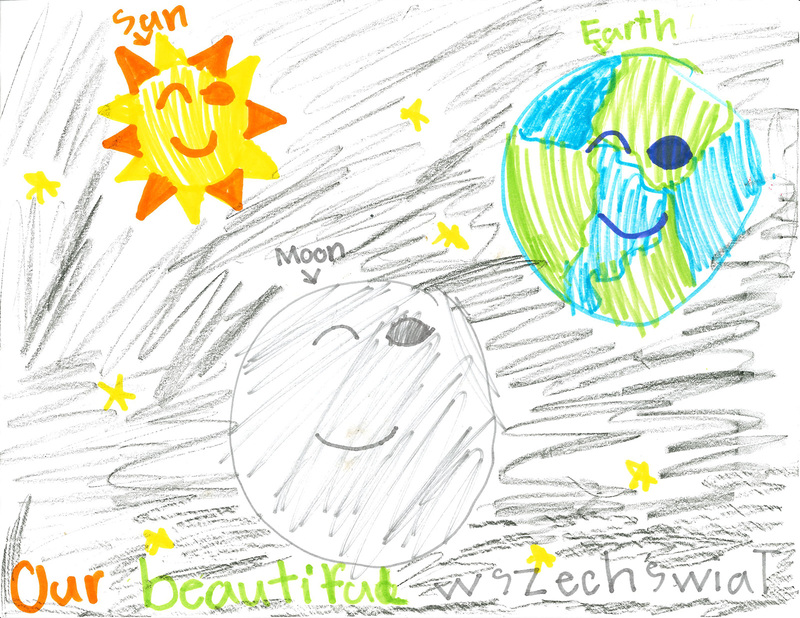 Quote from the Artist: A happy sun, Earth and moon. 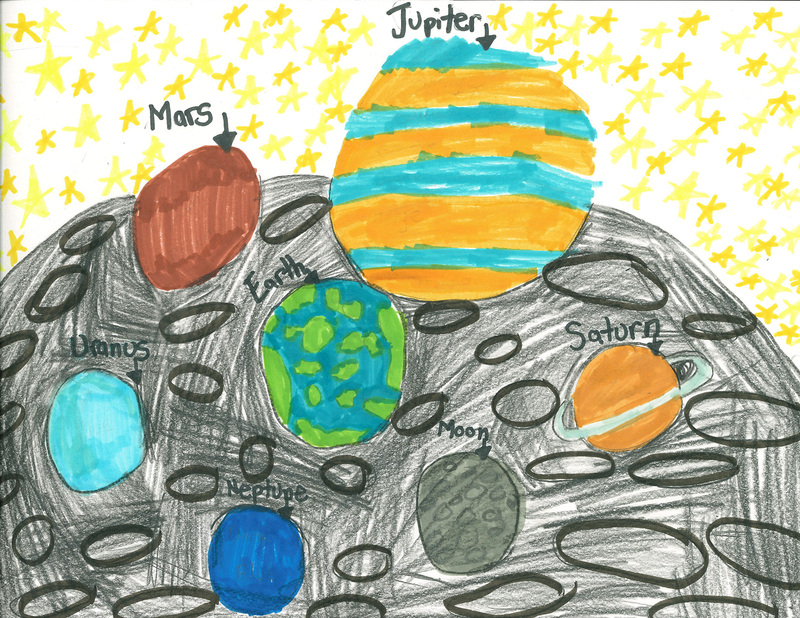 Quote from the Artist: "View of the moon, sun, Earth and planets surrounded by stars." 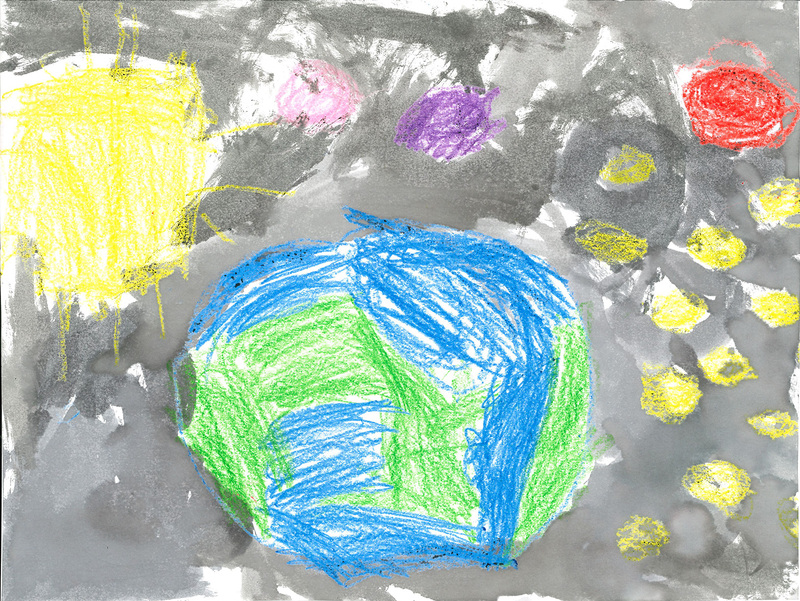 Quote from the Artist: "Colorful planets in the dark sky. Used markers & colored pencils." 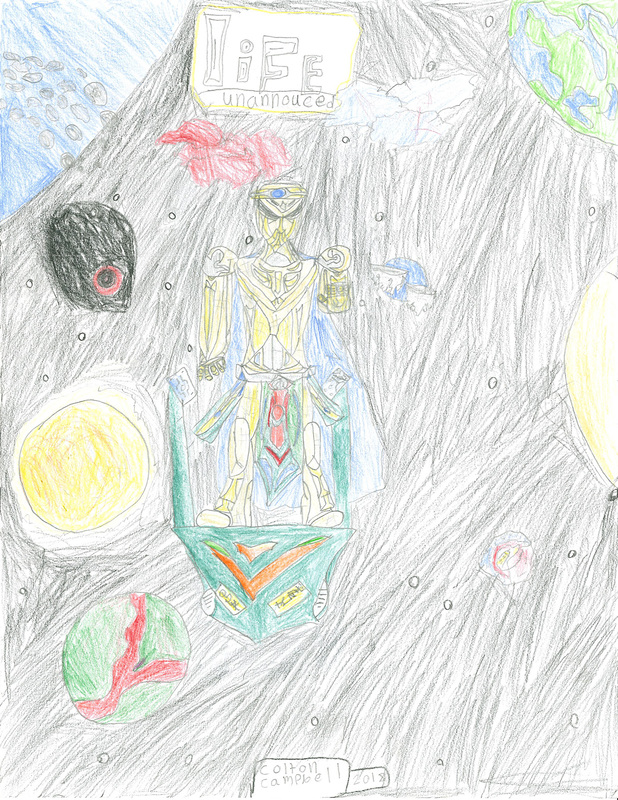 Quote from the Artist: "Outer space with aliens and spaceship." 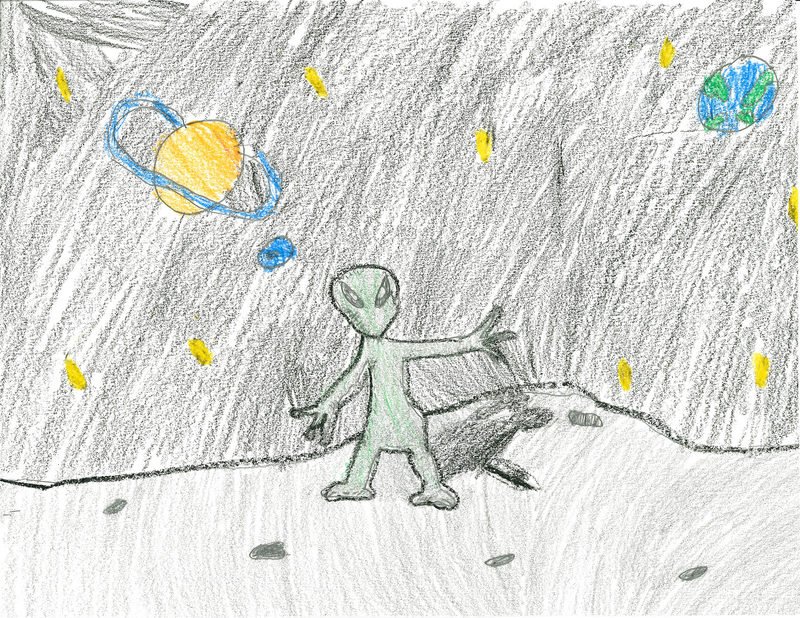 Quote from the Artist: "On my trip to outer space I saw an alien on the moon." 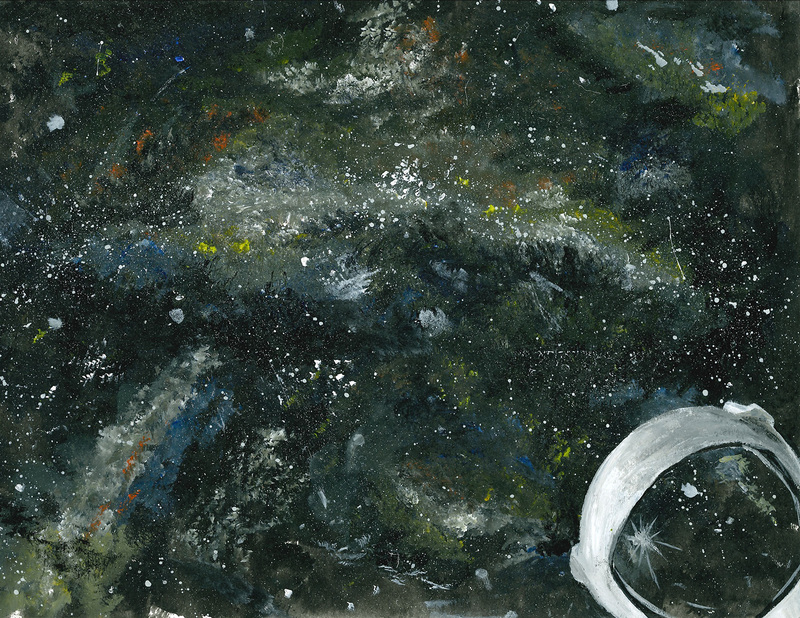 Quote from the Artist: "A space kitty lost her milk on the way to the Milky Way." 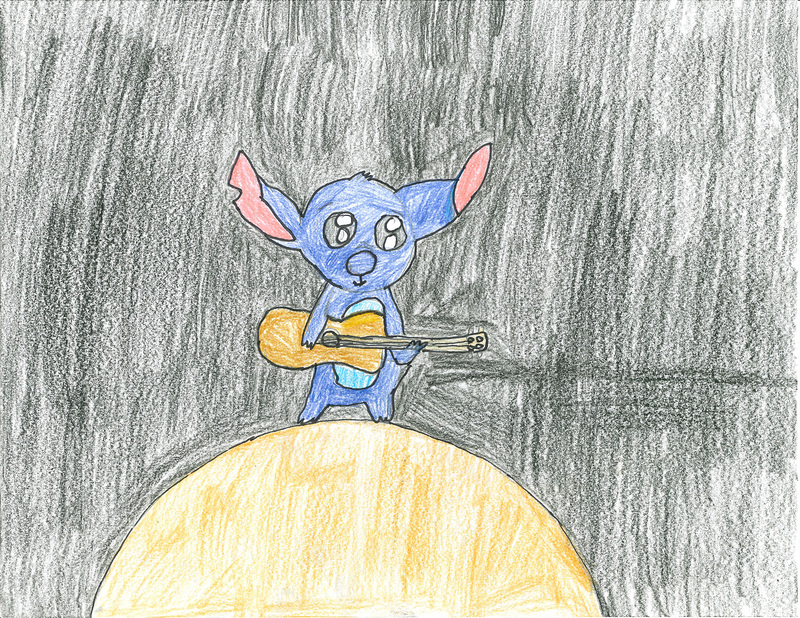 Quote from the Artist: "Stitch playing his guitar on Jupiter. I used colored pencils." 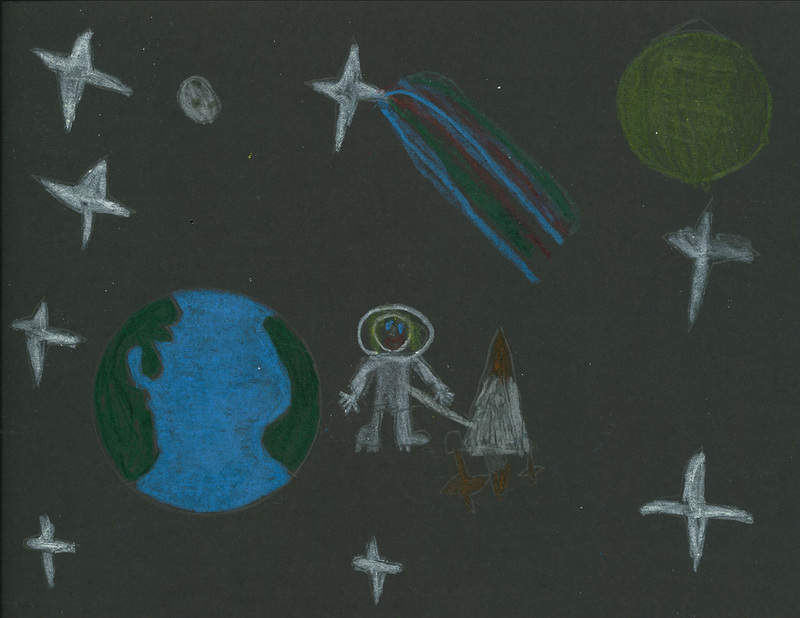 Quote from the Artist: "View from a rocket ship traveling thru space." 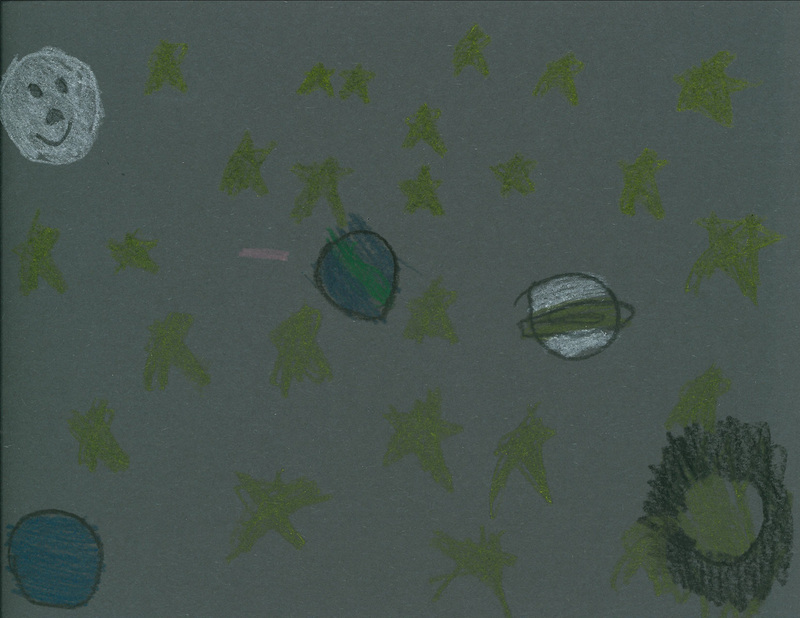 Quote from the Artist: "Every plant in our solar system. Each one is so different. 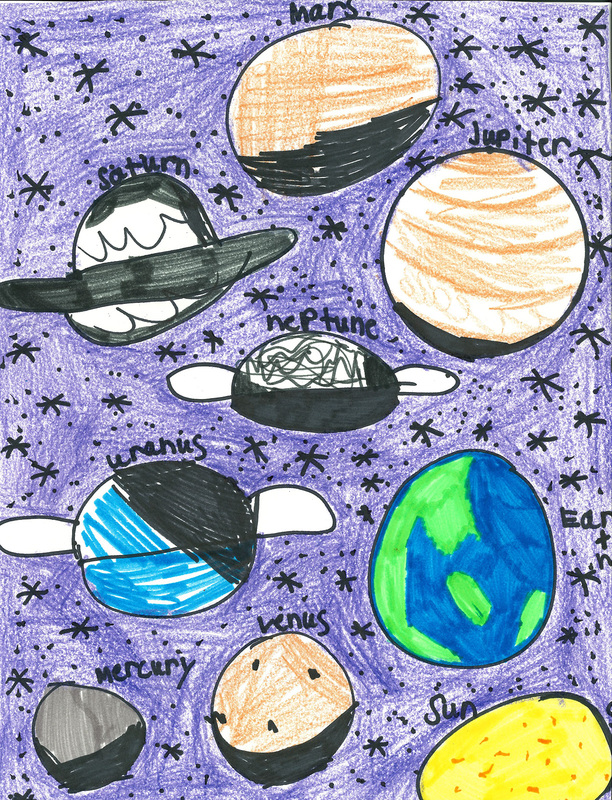 I love the planets." 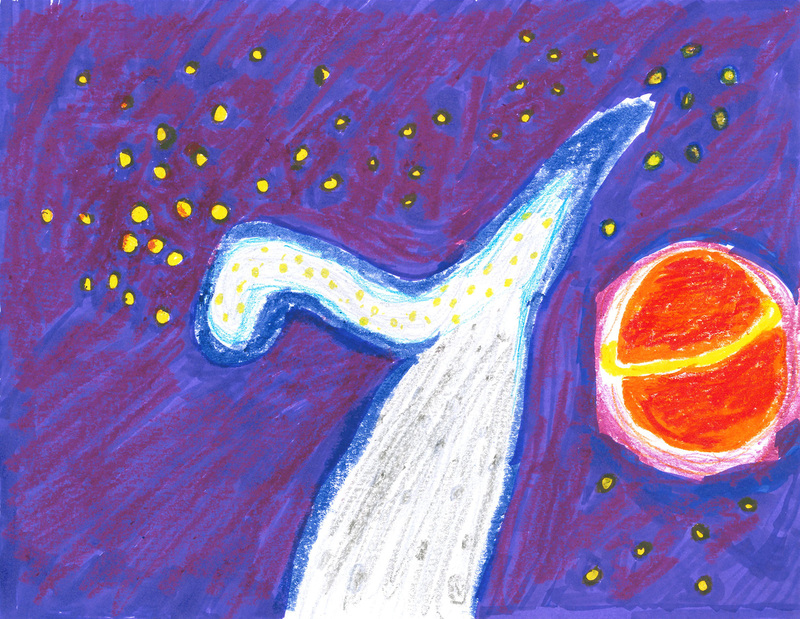 Quote from the Artist: "A rocket going into outer space." 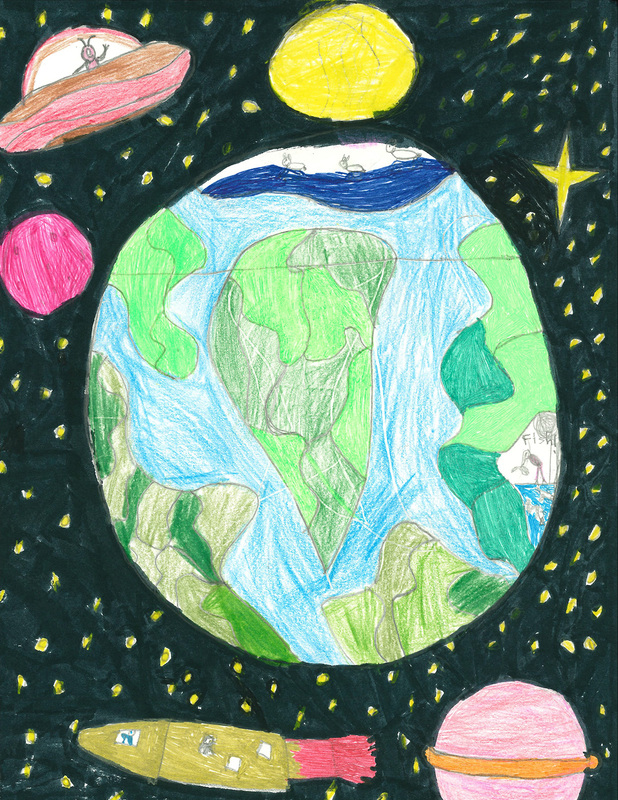 Quote from the Artist: "If I am sitting on a chair and looking into a telescope this is what I will see, Planet Dreams." 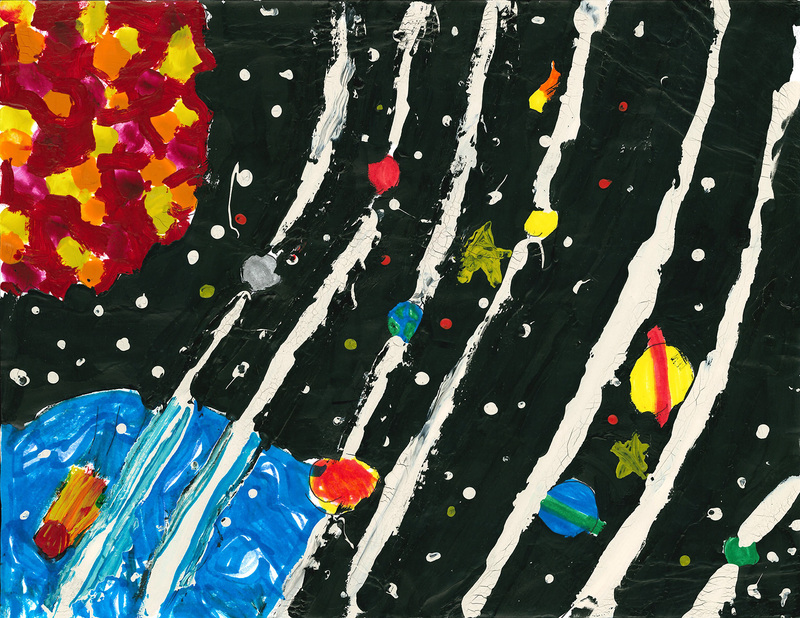 Quote from the Artist: "Spaceman, black background, orange & blue planets." 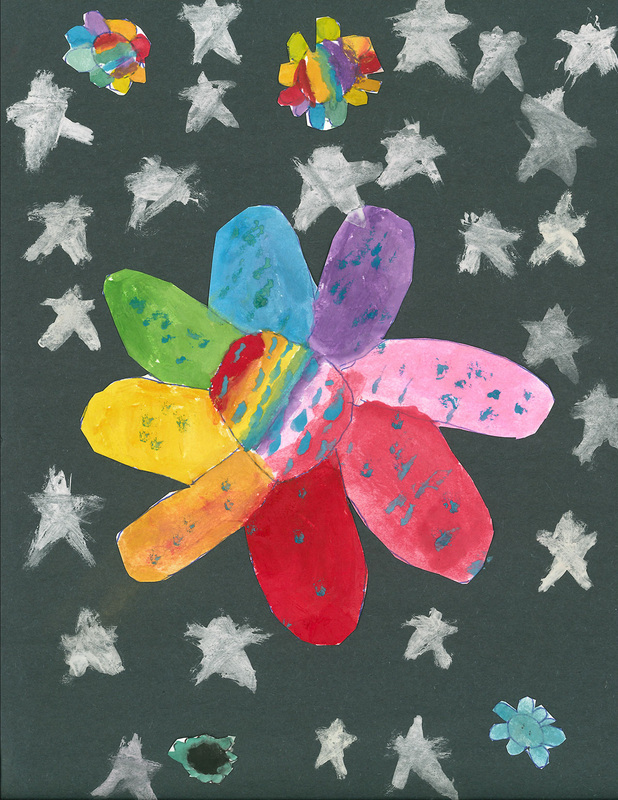 Quote from the Artist: "Everybody has flower pillows in outer space." 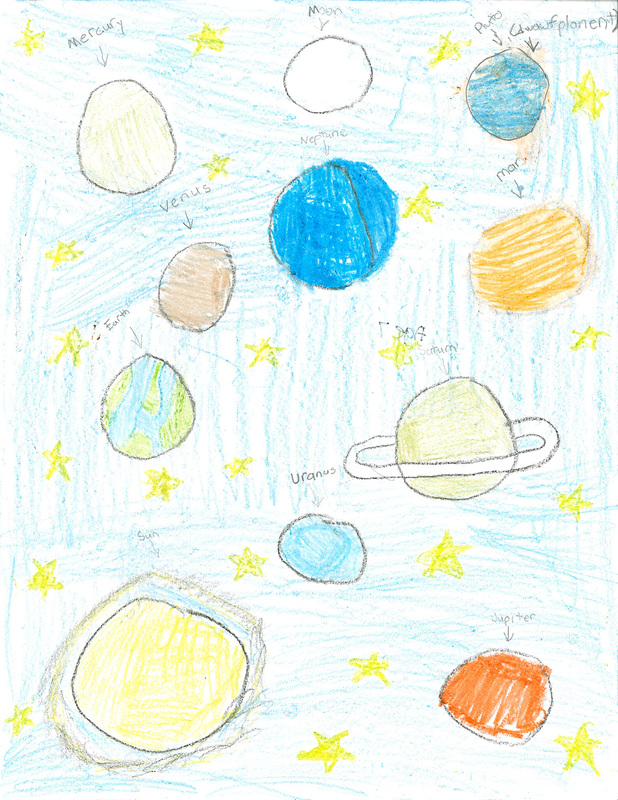 Quote from the Artist: "If I went to outer space, I would see all the planets, the Milky Way and the wonderful colors of the galaxy. I would stand on Uranus. My favorite part would be seeing all the colors." 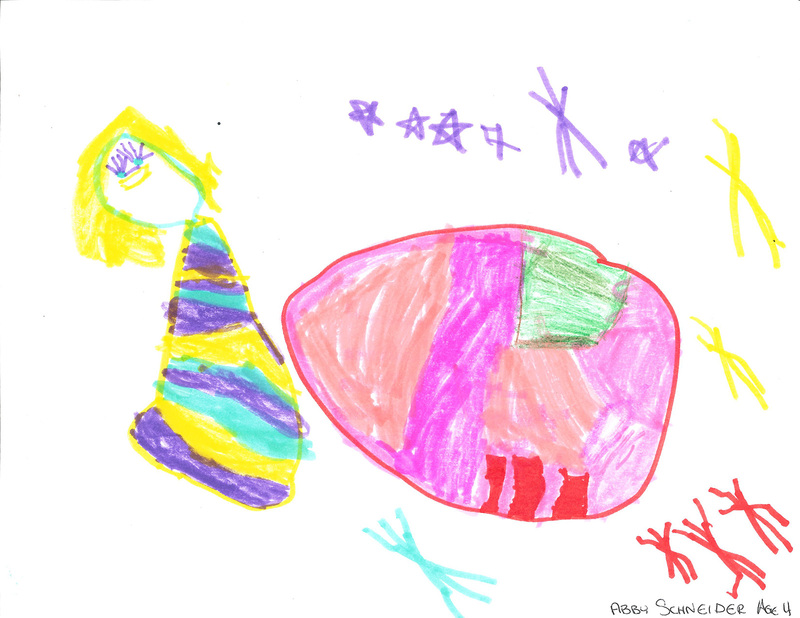 Quote from the Artist: "This is a distant galaxy, shaped like a spiral. It doesn't get much sunlight but it is still beautiful." 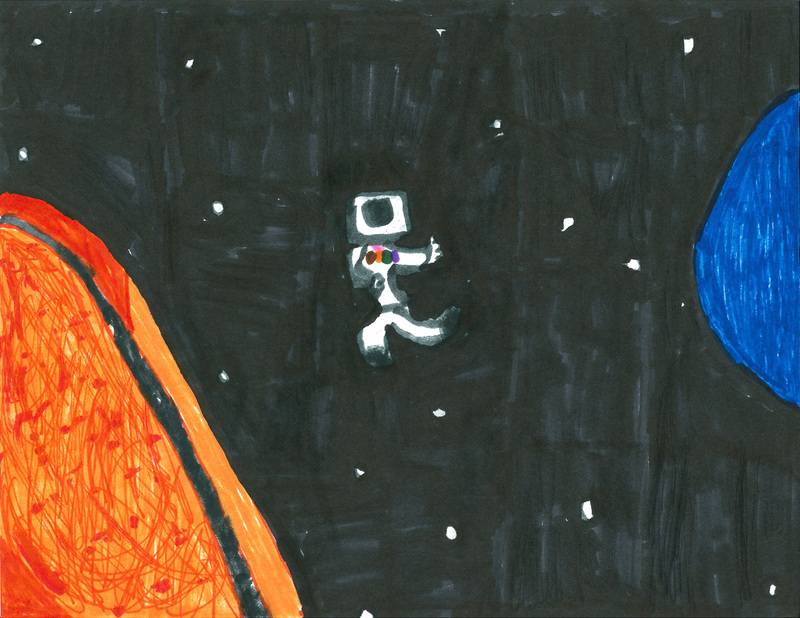 Quote from the Artist: "My picture is about a 10 year old astronaut who found Earth." 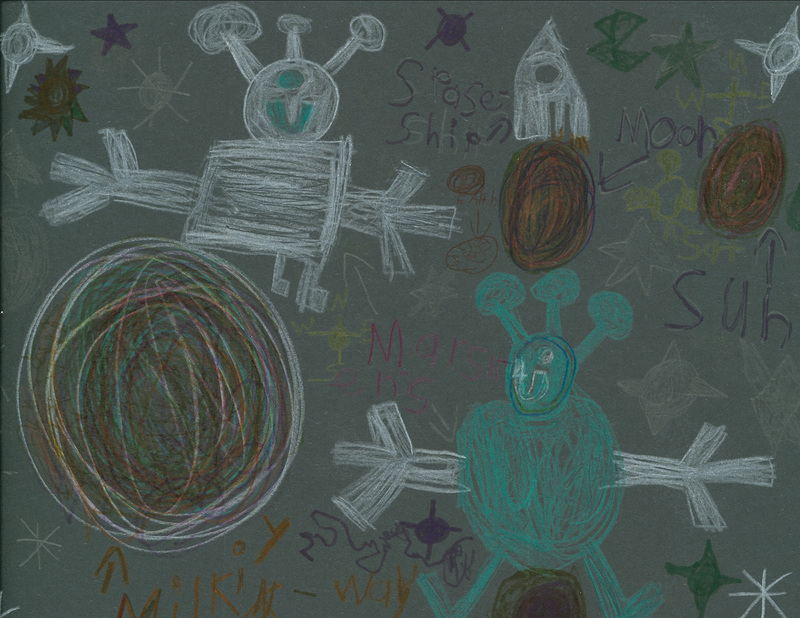 Quote from the Artist: "People and an Alien take a trip through space." 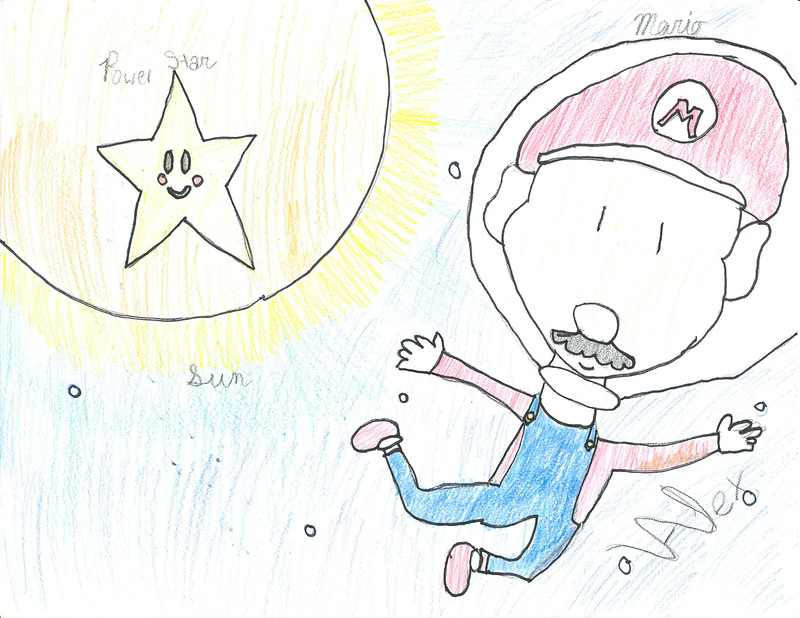 Quote from the Artist: "Mario is flying in space and waving hello to Alex, my little brother because he loves Mario. 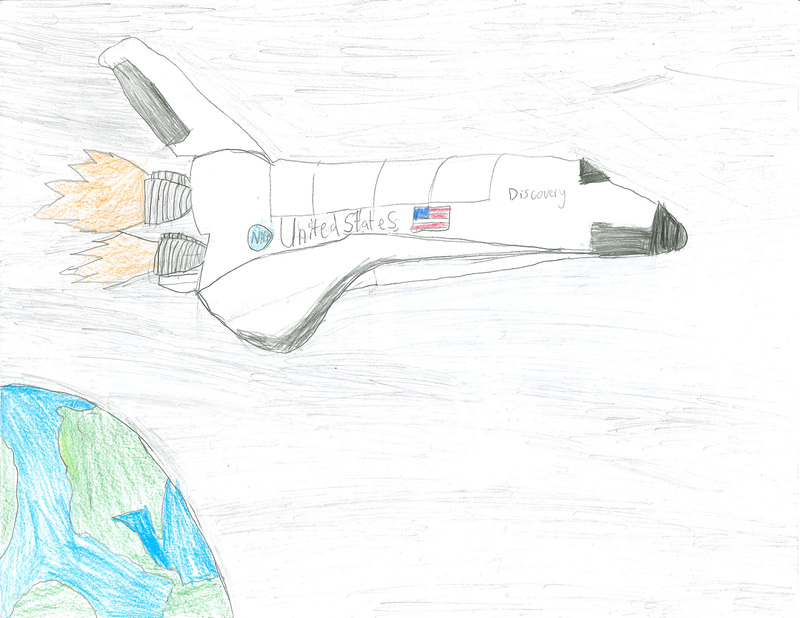 I drew the picture for him"
Quote from the Artist: "The space shuttle Discovery orbits the Earth." 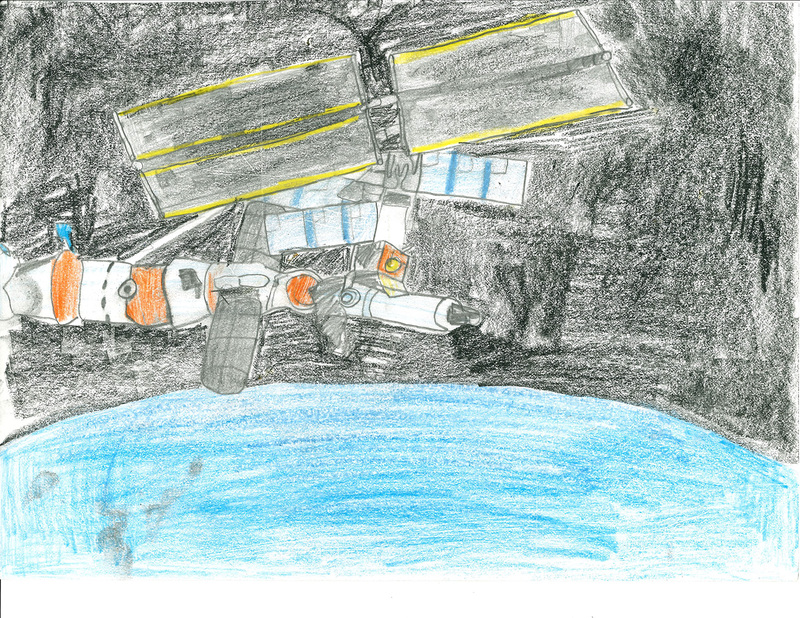 Quote from the Artist: "This is a space station collecting sun for power to discover new life." 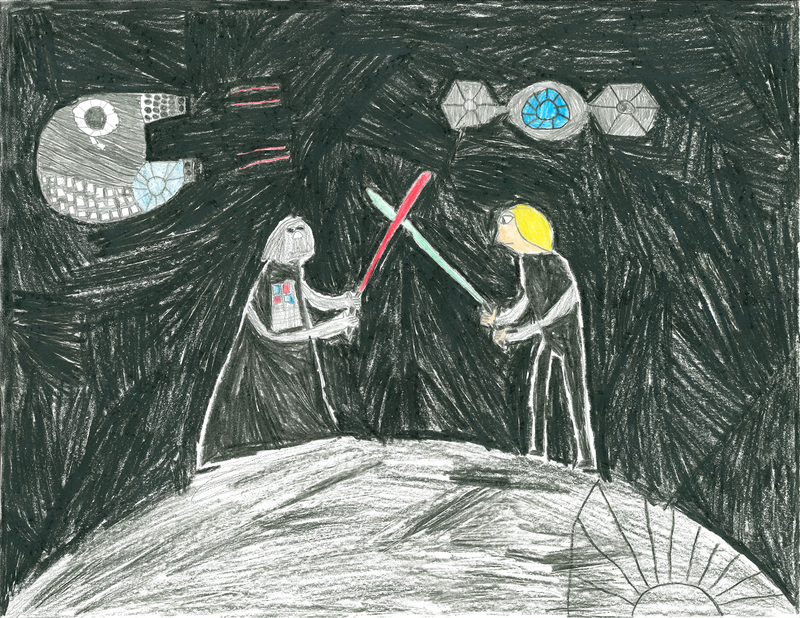 Quote from the Artist: "Luke Skywalker fighting Darth Vader." 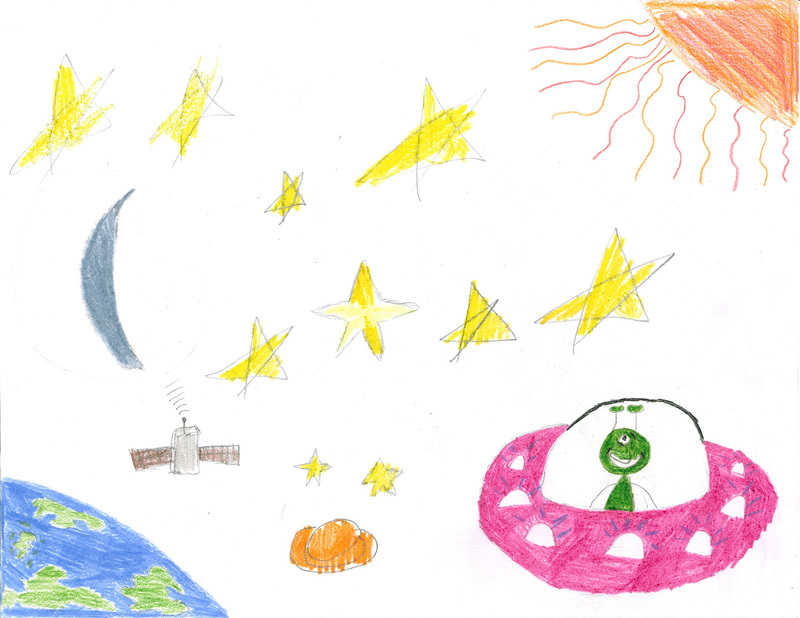 Quote from the Artist: "This is Chatari who is exploring the galaxy searching for new planets and black holes." 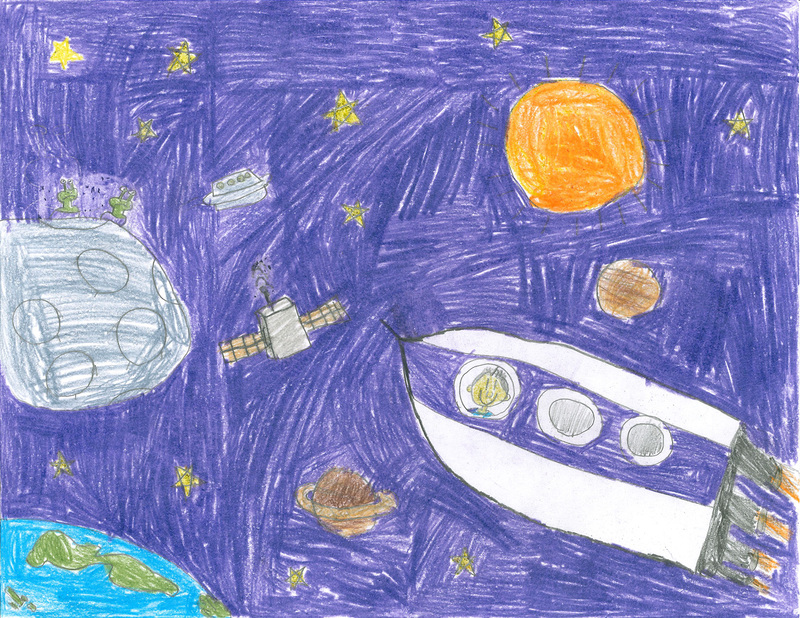 Quote from the Artist: "When a NASA spaceship flies through outer space the astronauts sees how big and beautiful space is seeing all of the planets almost lined up for a Solar Eclipse along with a star or the North Star." 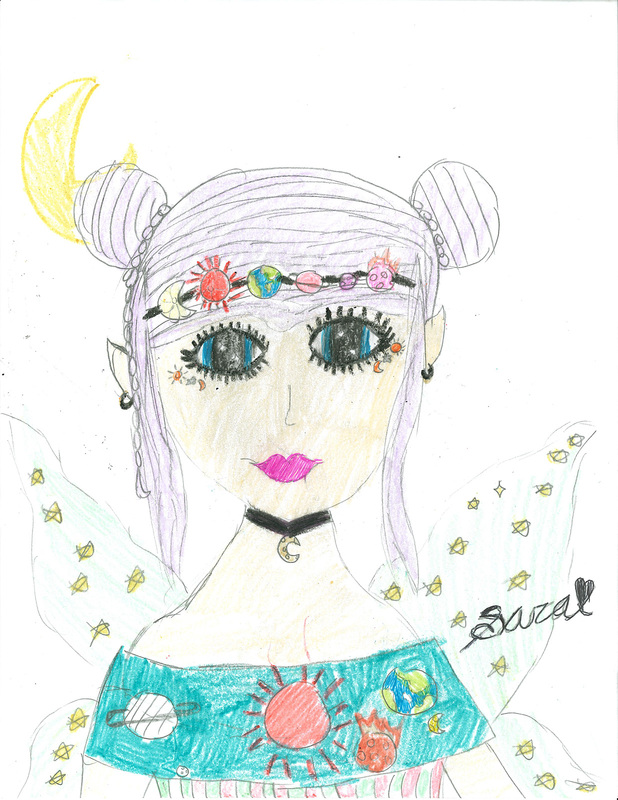 Quote from the Artist: "A fairy that loves space." 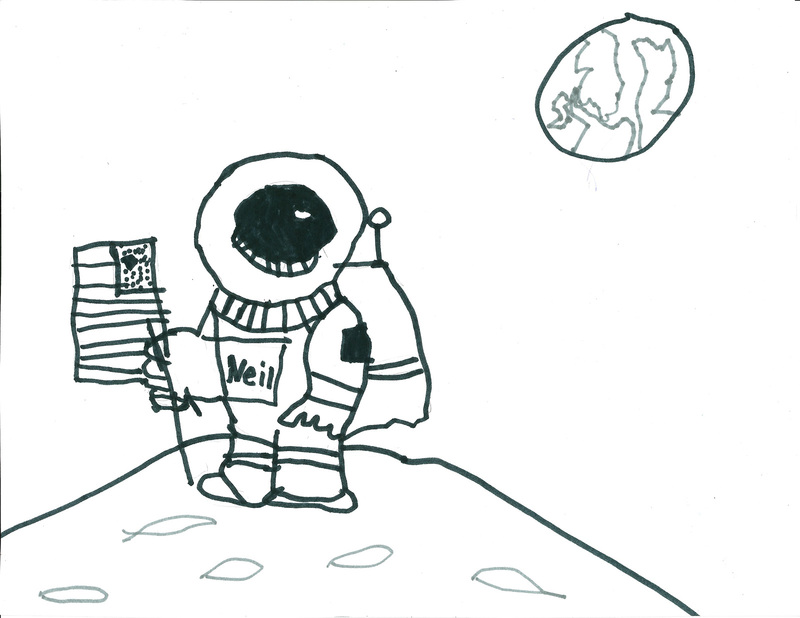 Quote from the Artist: "Neil Armstrong is on the moon and he is going to put the flag on the moon." 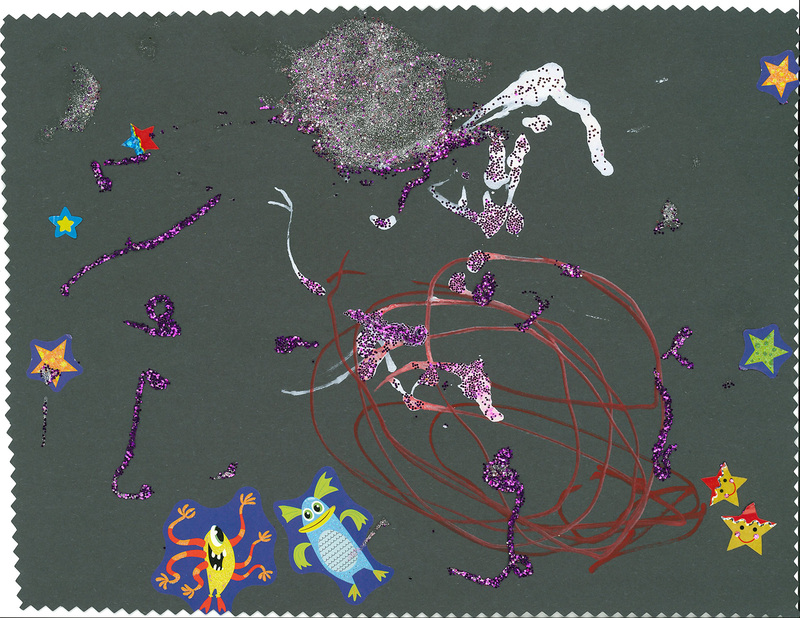 Quote from the Artist: "Each animal can have their own place in space." 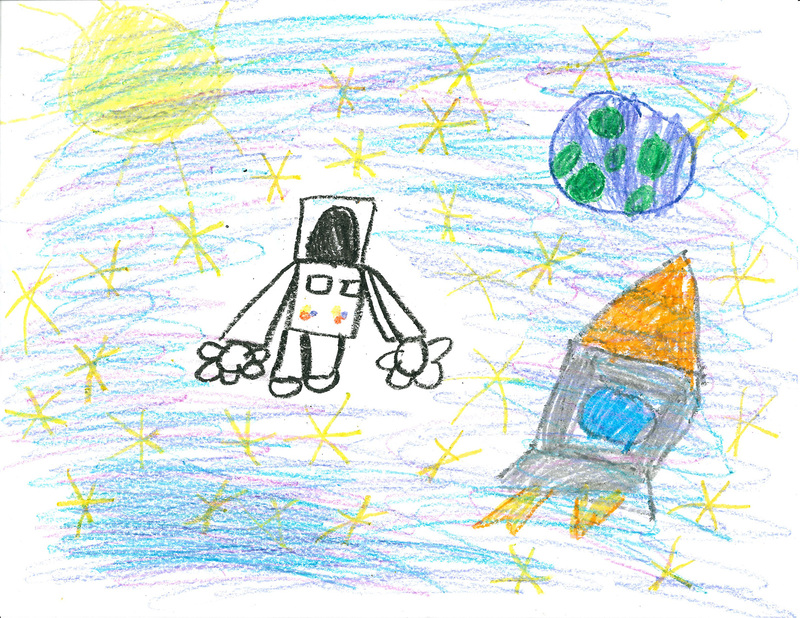 Quote from the Artist: "I would take my rocket to see outer space. What I would see is the outer rim zoo. 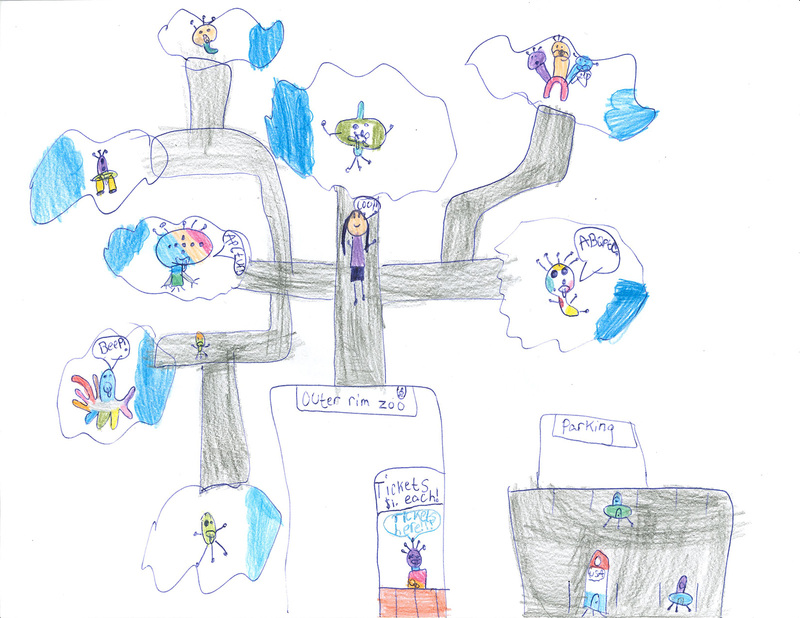 It is a zoo with Aliens instead of animals." 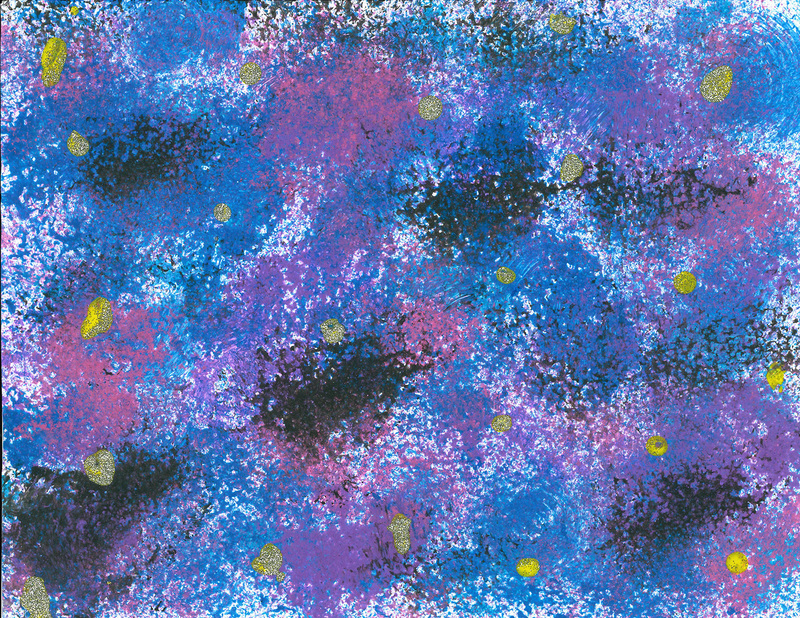 Quote from the Artist: "Starry night is a galaxy picture with glittery stars around it. I got the idea by thinking of a galaxy of stars. Then, I decided to add glitter." 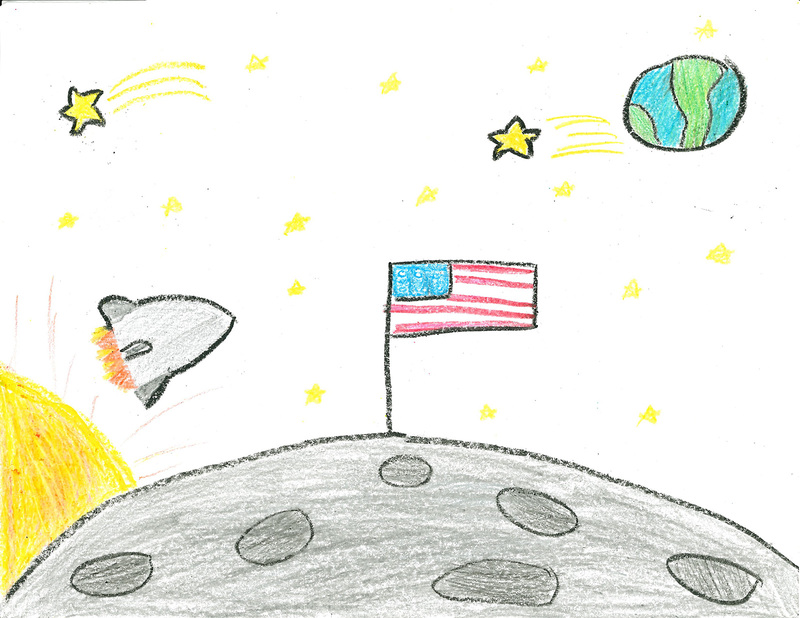 Quote from the Artist: "Rocket to the Moon." 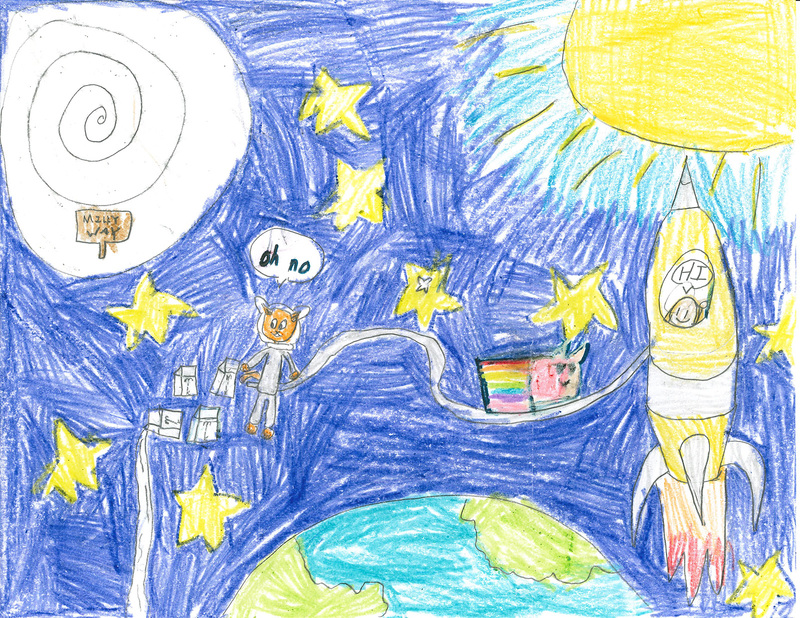 Quote from the Artist: "Ann the Astronaut sees the beauty of the night sky while witnessing the Milky Way." 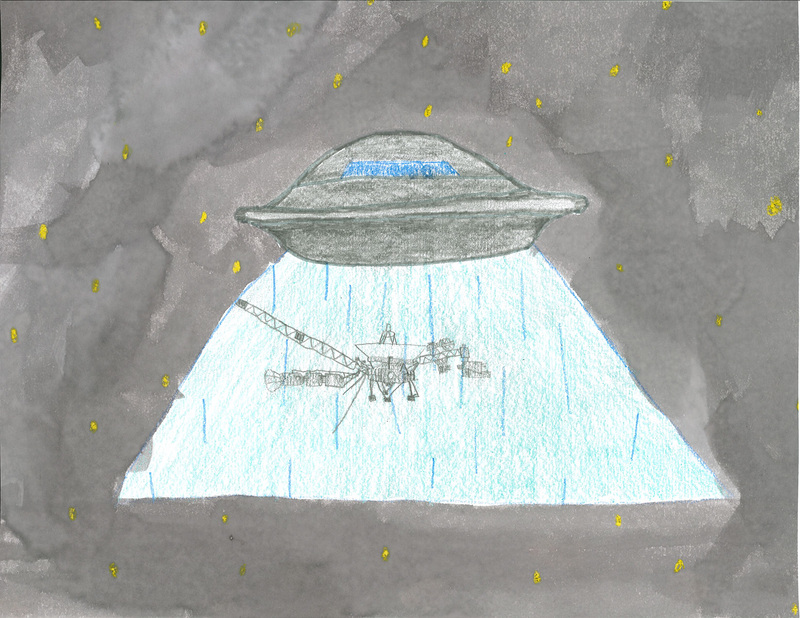 Quote from the Artist: "The Voyager I space probe is flying through interstellar space when suddenly a UFO starts to abduct it." 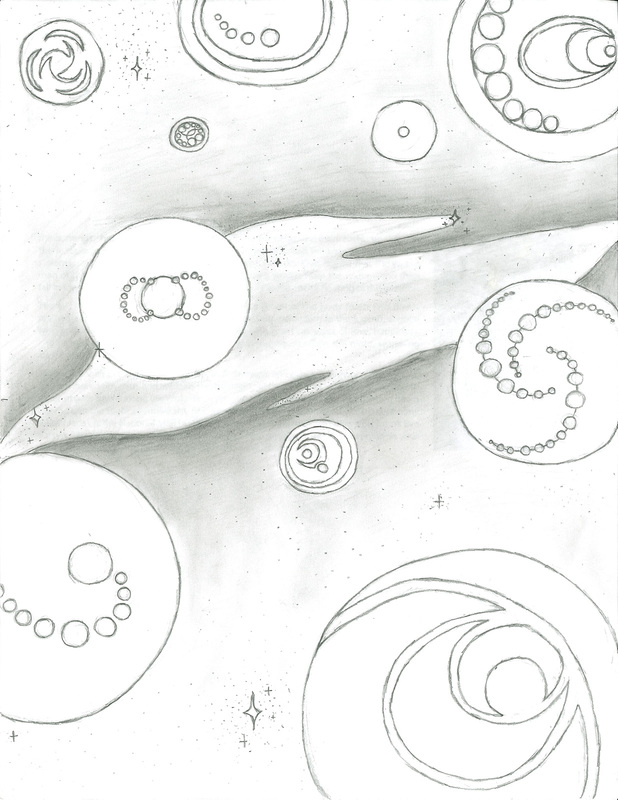 Quote from the Artist: "Each of the large planets are lined up in a row until Saturn with its bold black rings. A shooting star is going past Jupiter with is fiery tale. 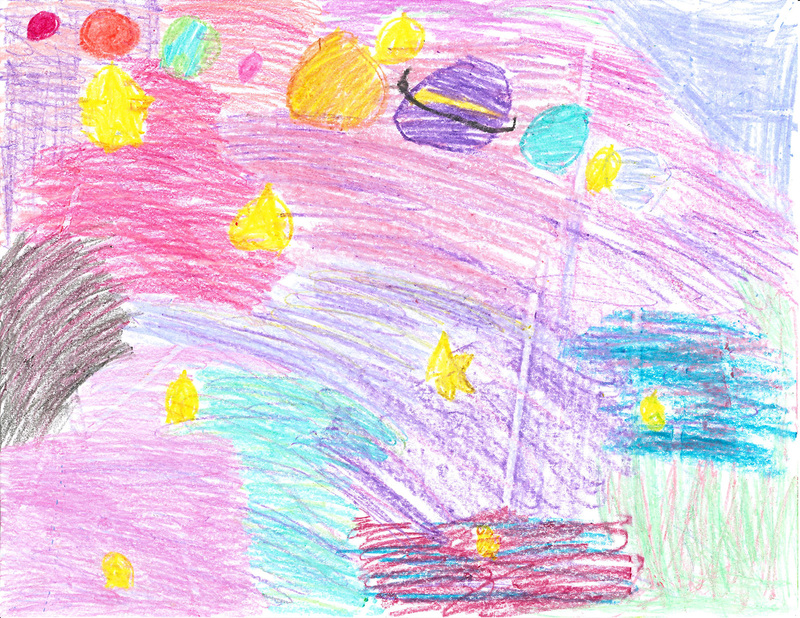 That's me in my space ship looking into my colorful Milky Way." 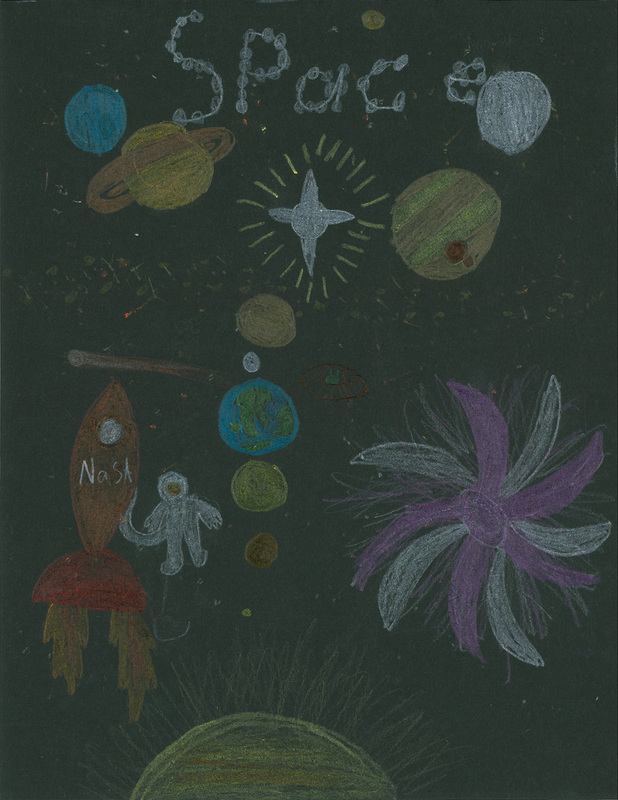 Quote from the Artist: "What I would see beyond outer space." 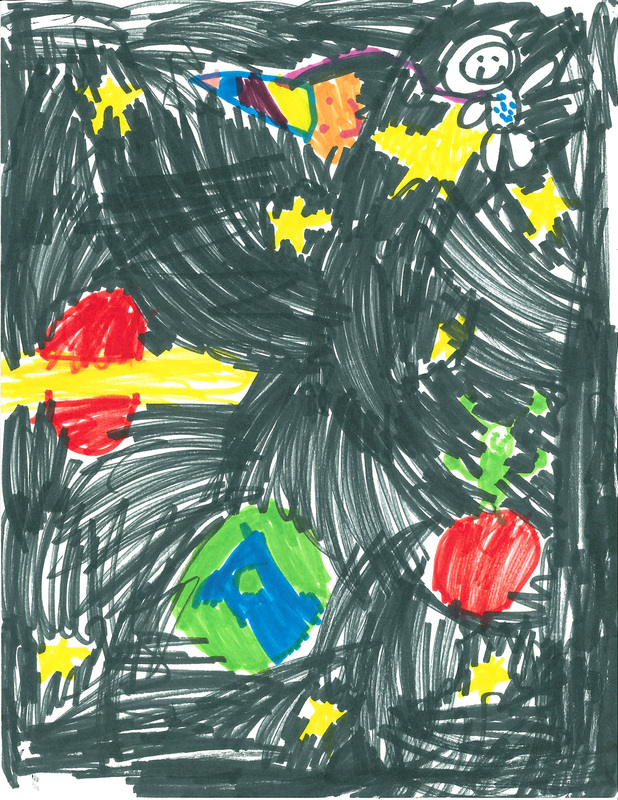 Quote from the Artist: "Spaceship with Martian in it and it is coming toward earth, there are stars and a sun in the sky too." 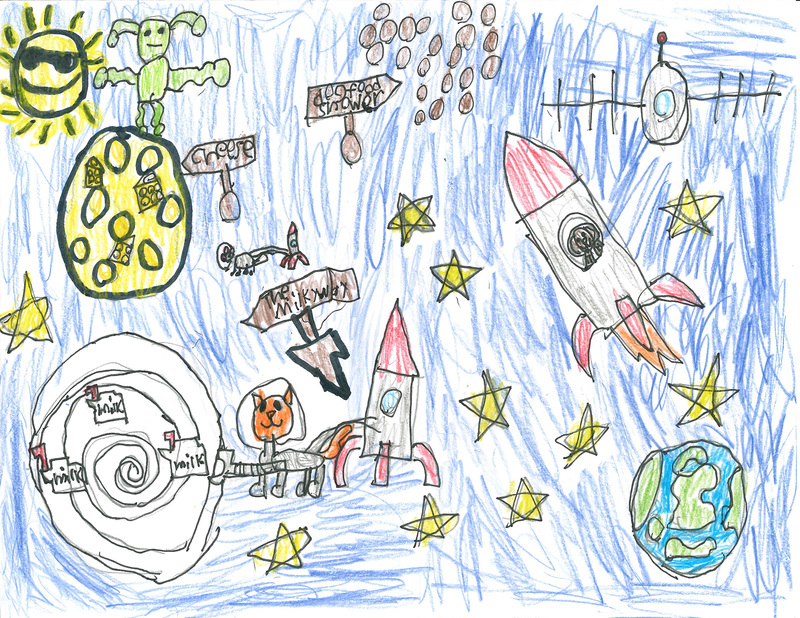 Quote from the Artist: "Rocket ships, UFOs, Martians, planets, satellite, stars and sun." 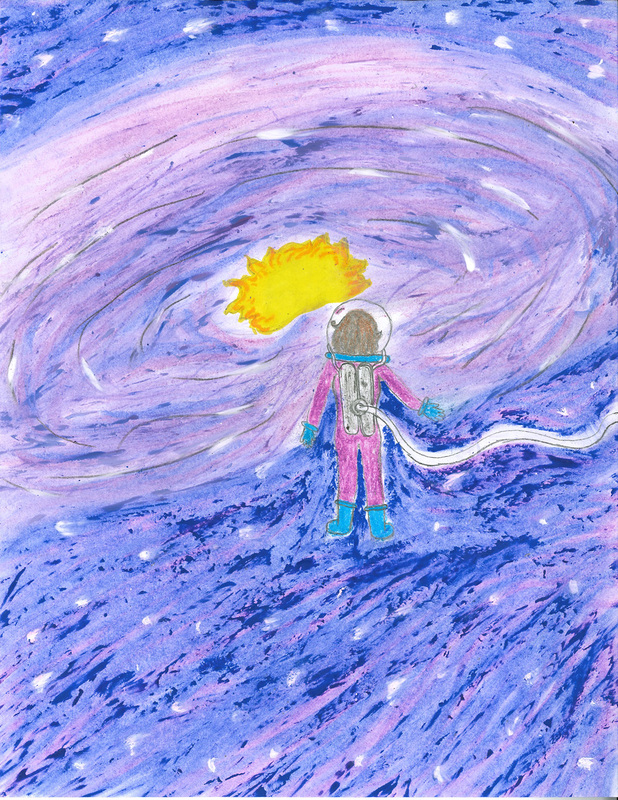 Quote from the Artist: "Through her helmet, an astronaut sees more wonders than she can count." 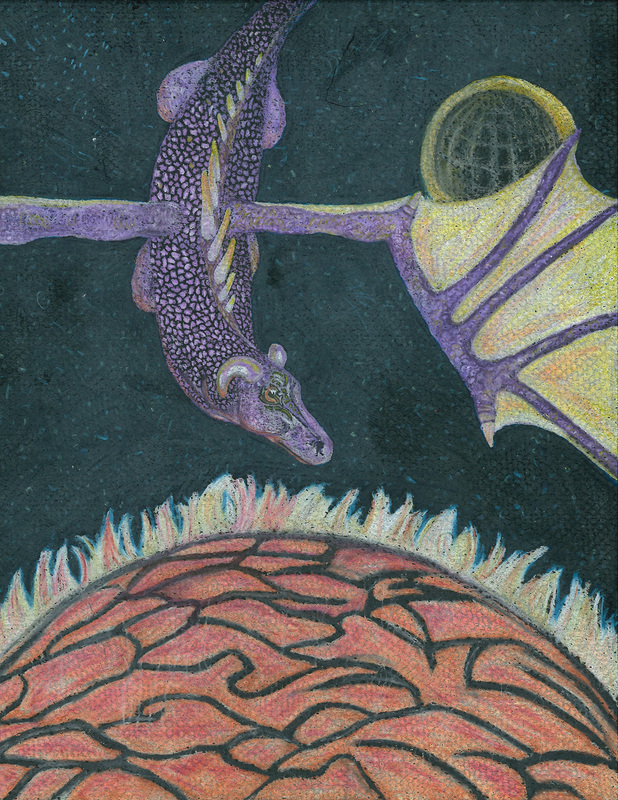 Quote from the Artist: "Purple solar dragon flies over flaming planet while its sun is being eclipsed behind it." 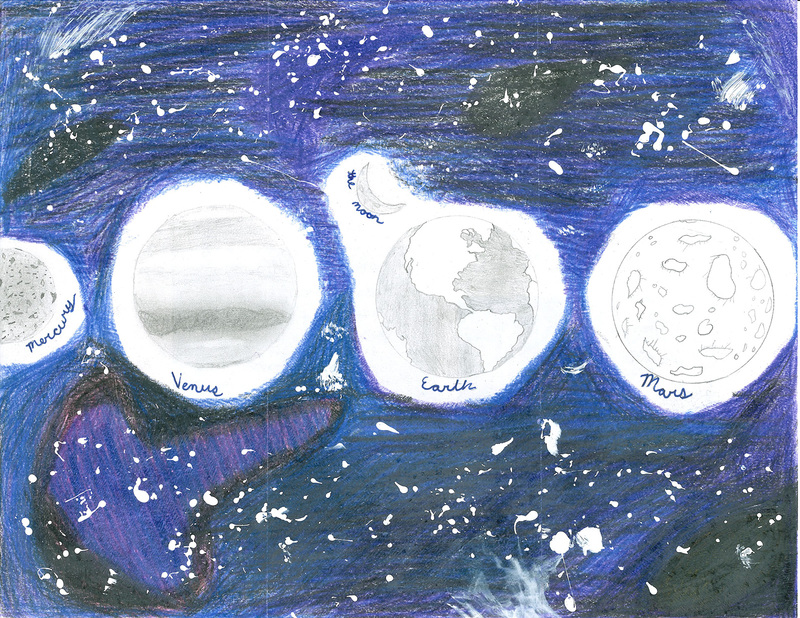 Quote from the Artist:"If I went to outer space, I would see Mercury, Venus, Earth, the Moon, and Mars, as they are all the closest." 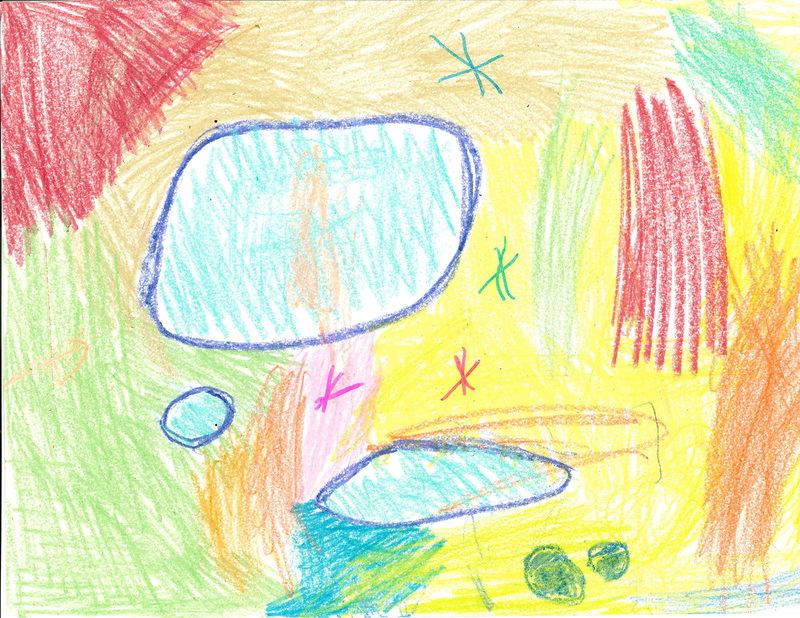 Quote from the Artist: "My picture is what I think another galaxy in outer space would look like. Done is pencil." 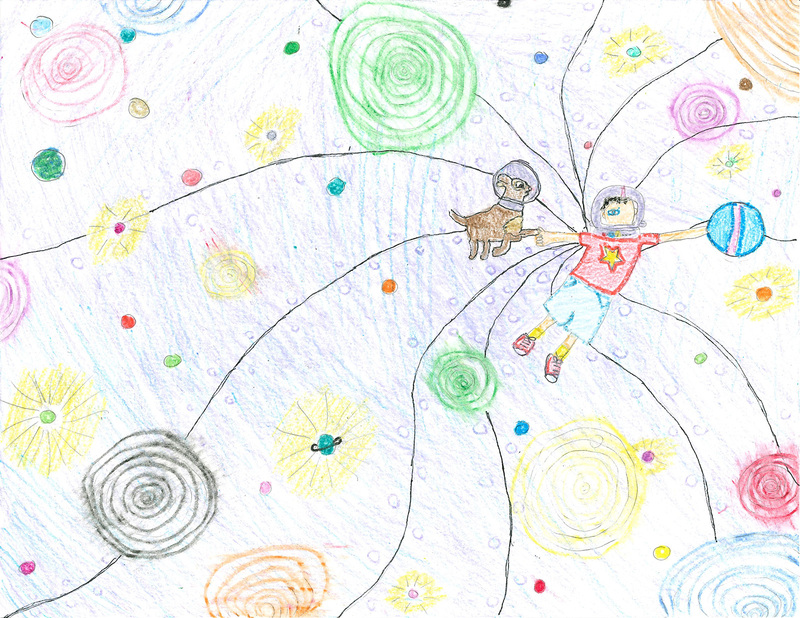 Quote from the Artist: "Auggie Paulman and Daisy the dog from wonder wanted to go to outer space so if I went to outer space I bet I would see them." Quote from the Artist: "An illustration of God's miraculous deeds. 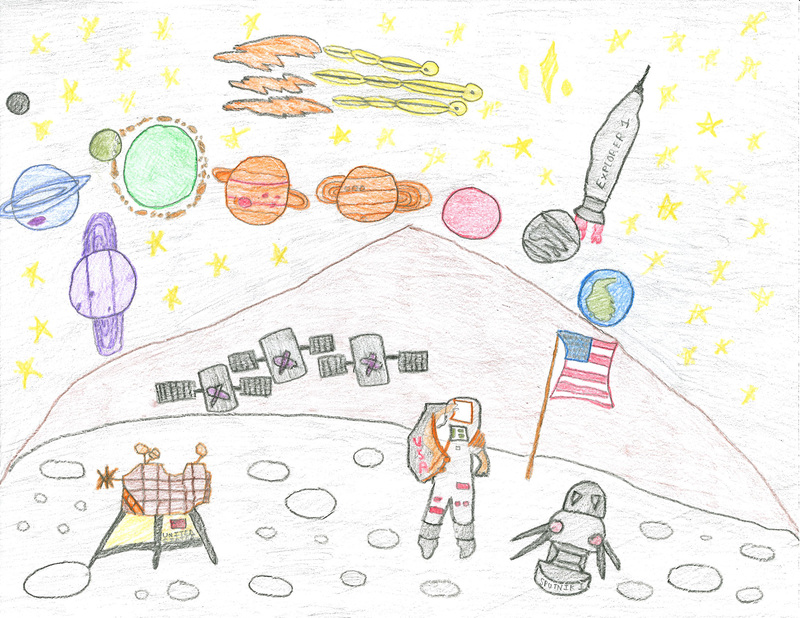 This illustration shows the moon, distant mountains, all the planets, a satellite dish, Sputnik, an astronaut, the American Flag and lastly Explorer I." 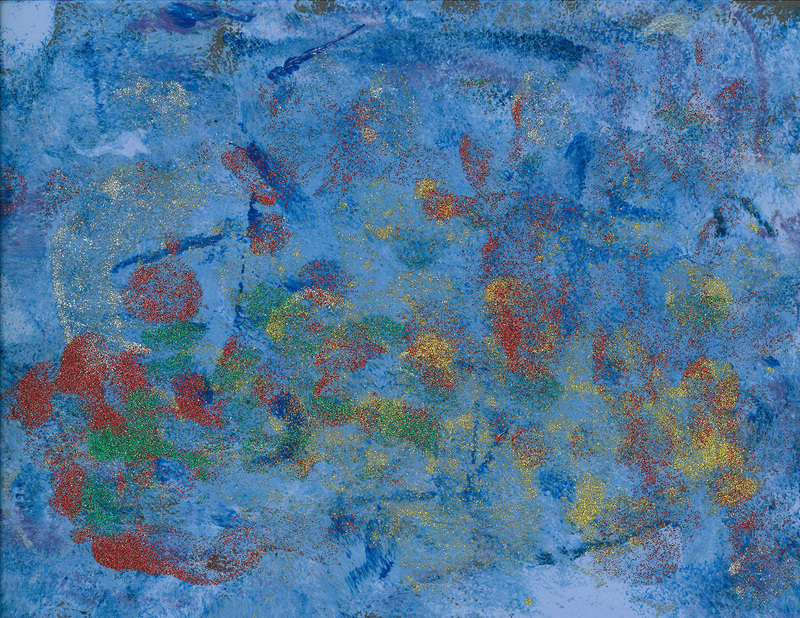 Quote from the Artist: "On the left there are starts scattered as well as a flowing belt of stars and matter. 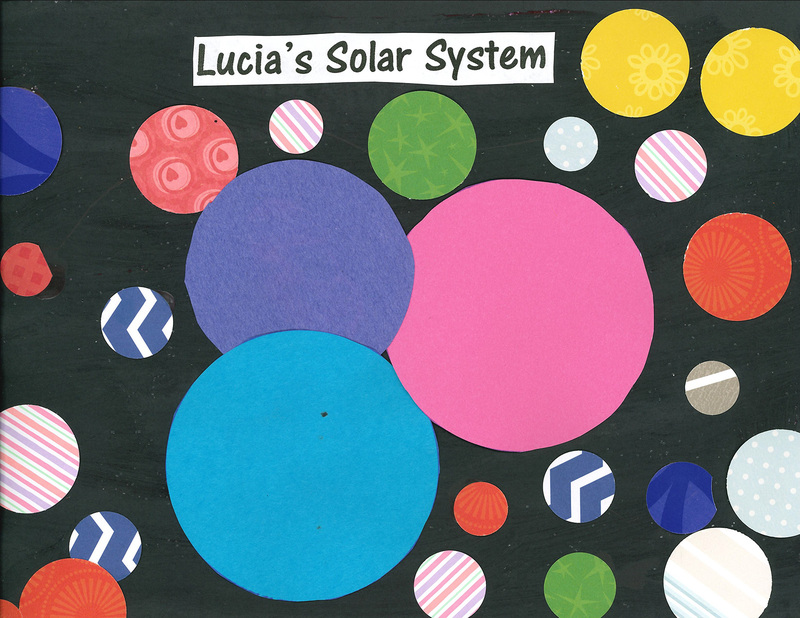 In the middle going from bottom to top, there is a belt of rocks and matter and on the right there is a planet with rings." 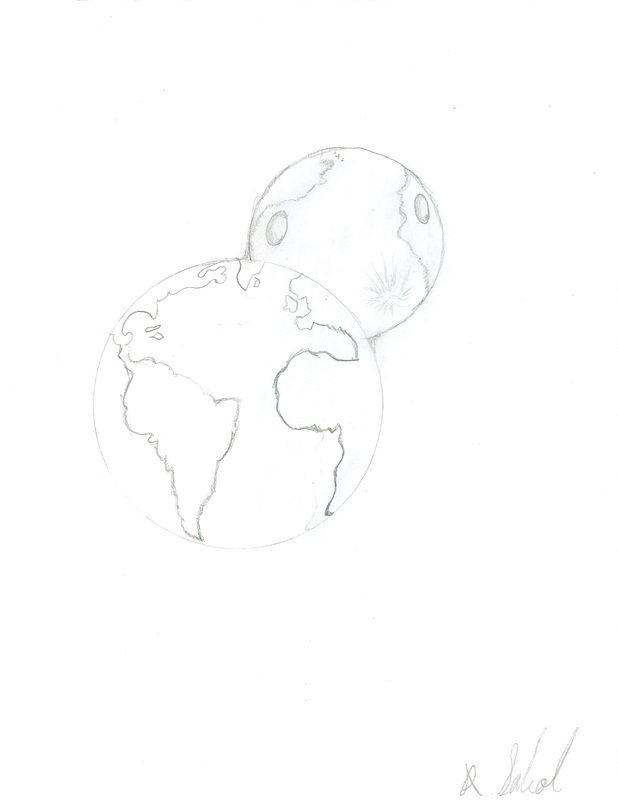 Quote from the Artist: "This is a pencil drawing of what I believe the Earth and Moon looked like before we polluted and destroyed the oceans and land. Including all the plants and wildlife."